The Clarion-Clipperton Fracture Zone (CCFZ) in the northeastern Pacific is a potential area for deep-sea mining, comprises the worldwide largest polymetallic nodule fields and is one of the most difficult to sample and thus unknown ecosystems. Glass sponges (Hexactnellida) represent a main group of benthic deep-sea megafauna, especially hexasterophorid sponges, but only few studies have been published so far. This is the first study focusing on the taxonomy of hexasterophorid sponges from polymetallic nodule fields in the CCFZ and includes descriptions of eight known and six new species: Hyalostylus microfloricomus sp. nov.; Hyalostylus schulzei sp. nov.; Docosaccus nidulus sp. nov.; Holascus spinosus sp. nov.; Caulophacus (Caulophacus) wilsoni sp. nov.; and Chonelasma bispinula sp. nov. 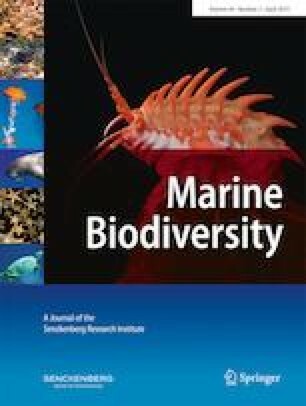 The EcoResponse cruise with RV Sonne was financed by the German Ministry of Education and Science (BMBF) as a contribution to the European project JPI-Oceans “Ecological Aspects of Deep-Sea Mining.” The authors acknowledge funding from BMBF under contract 03F0707E. Furthermore, we want to thank Prof. Dr. Jens Greinert and M.Sc. Florian Gausepohl (GEOMAR—Helmholtz Centre for Ocean Research, Kiel) for support with station maps.